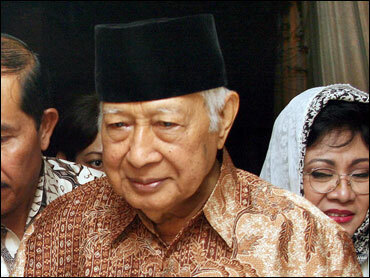 Former Indonesian President Suharto, the U.S. Cold War ally who led one of the 20th century's harshest and most corrupt dictatorships over 32 years that saw up to a million political opponents killed, died Sunday. He was 86. Suharto had been ailing in a hospital in the capital, Jakarta, since he was admitted on Jan. 4 with failing kidneys, heart and lungs. Dozens of doctors prolonged his life using dialysis and a ventilator, but he stopped breathing on his own overnight before slipping into a coma Sunday. He was declared dead at 1:10 p.m. (0610 GMT) when his heart stopped. The cause of death was multiple organ failure, Chief Presidential Dr. Marjo Subiandono said in a statement. "My father passed away peacefully," sobbed Suharto's eldest daughter, Tutut. "May God bless him and forgive all of his mistakes." Suharto's body was to be washed according to Islamic custom, and joint prayers were held at the family home in the presence of his six children, President Susilo Bambang Yudhoyono and dozens of the country's ruling elite. Yudhoyono's office declared a week of national mourning. The president was to oversee a state funeral Monday after a fleet of 11 Air Force planes flies Suharto's body to the family mausoleum near the city of Solo, 250 miles east of Jakarta. In a televised address, Yudhoyono called on "the people of Indonesia to pay their last respects to one of Indonesia's best sons ... who has done very great service to his beloved nation." Suharto was finally toppled by mass street protests in 1998. His departure from office opened the way for democracy in this predominantly Muslim nation of 235 million people and he withdrew from public life, rarely venturing from his comfortable Jakarta villa. Suharto had ruled with a totalitarian dominance that saw soldiers stationed in every village, instilling a deep fear of authority across this Southeast Asian nation that stretches across more than 3,000 miles. Since being forced from power, he had been in and out of hospitals after strokes caused brain damage and impaired his speech. But poor health - and continuing corruption, critics charge - kept him from court after he was chased from office by widespread unrest at the peak of the 1997-1998 Asian financial crisis. The bulk of killings occurred in 1965-1966 when between 300,000 and 800,000 alleged communists were rounded up and slain during his rise to power. Over the next three decades, a further 300,000 people were killed, disappeared or starved in the independence-minded regions of East Timor, Aceh and Papua, human rights groups and the United Nations say. Suharto's successors as head of state - B. J. Habibie, Abdurrahman Wahid, Megawati Sukarnoputri and Yudhoyono - vowed to end the graft that took root under Suharto, yet it remains endemic at all levels of Indonesian society. With the court system paralyzed by corruption, the country has not confronted its bloody past. Rather than put on trial those accused of mass murder and multi-billion-dollar theft, some members of the political elite consistently called for charges against Suharto to be dropped on humanitarian grounds. Some noted Suharto also oversaw decades of economic expansion that made Indonesia the envy of the developing world. Today, nearly a quarter of Indonesians live in poverty, and many long for the Suharto era's stability, when fuel and rice were affordable. On Sunday, hundreds of mourners - some weeping - flocked to the family home in downtown Jakarta. "I felt crushed when I heard he had died. We have lost a great man," said Mamiarti, a 43-year-old housekeeper. "It used to be easy to find jobs. Now it is hard." But critics say Suharto squandered Indonesia's vast natural resources of oil, timber and gold, siphoning the nation's wealth to benefit his cronies, foreign corporations and family like a mafia don. Jeffrey Winters, associate professor of political economy at Northwestern University, said the graft effectively robbed "Indonesia of some of the most golden decades, and its best opportunity to move from a poor to a middle class country." "When Indonesia does finally go back and redo history, (its people) will realize that Suharto is responsible for some of the worst crimes against humanity in the 20th century," Winters said. Those who profited from Suharto's rule made sure he was never portrayed in a harsh light at home, Winters said, so even though he was an "iron-fisted, brutal, cold-blooded dictator," he was able to stay in his native country. Like many Indonesians, Suharto used only one name. He was born on June 8, 1921, to a family of rice farmers in the village of Godean in the dominant Indonesian province of Central Java. When Indonesia gained independence from the Dutch in 1949, Suharto quickly rose through the ranks of the military to become a staff officer. His career nearly foundered in the late 1950s, when the army's then-commander, Gen. Abdul Haris Nasution, accused him of corruption in awarding army contracts. Absolute power came in September 1965 when the army's six top generals were murdered under mysterious circumstances, and their bodies dumped in an abandoned well in an apparent coup attempt. Suharto, next in line for command, quickly asserted authority over the armed forces. What followed was a nationwide purge of suspected leftists, a campaign that stood as the region's bloodiest event since World War II until the Khmer Rouge established its gruesome regime in Cambodia a decade later. Over the next year, Suharto eased out of office Indonesia's first post-independence president, Sukarno, who died under house arrest in 1970. The legislature rubber-stamped Suharto's presidency and he was re-elected unopposed six times. During the Cold War, Suharto was considered a reliable friend of Washington, which did not oppose his violent occupation of Papua in 1969 and the bloody 1974 invasion of East Timor. The latter, a former Portuguese colony, became Asia's youngest country with a U.N.-sponsored plebiscite in 1999. Even Suharto's critics agree his hard-line policies kept a lid on Indonesia's extremists and held together the ethnically diverse and geographically vast nation. He locked up without trial hundreds of suspected Islamic militants, some of whom later carried out deadly suicide bombings with the al Qaeda-linked terror network Jemaah Islamiyah after the attacks on the U.S. of Sept. 11, 2001. Meanwhile, the ruling clique that formed around Suharto - nicknamed the "Berkeley mafia" after the U.S. school they attended, the University of California, Berkeley - transformed Indonesia's economy and attracted billions of dollars in foreign investment. By the late 1980s, Suharto was describing himself as Indonesia's "father of development," taking credit for slowly reducing the number of abjectly poor and modernizing parts of the nation. But the government also became notorious for unfettered nepotism, and Indonesia was regularly ranked as one of the world's most corrupt nations as Suharto's inner circle amassed fabulous wealth. The World Bank estimates 20 percent to 30 percent of Indonesia's development budget was embezzled during his rule. Even today, Suharto's children and aging associates have considerable sway over the country's business, politics and courts. Efforts to recover the money have been fruitless. Suharto's youngest son, Hutomo "Tommy" Mandala Putra, was released from prison in 2006 after serving a third of a 15-year sentence for ordering the assassination of a Supreme Court judge. Another son, Bambang Trihatmodjo, joined the Forbes list of wealthiest Indonesians in 2007, with US$200 million (euro136 million) from his stake in the conglomerate Mediacom. State prosecutors accused Suharto of embezzling about US$600 million via a complex web of foundations under his control, but he never saw the inside of a courtroom. In September 2000, judges ruled he was too ill to stand trial, though many people believed the decision really stemmed from the lingering influence of the former dictator and his family. In 2007, Suharto won a $106 million defamation lawsuit against Time magazine for accusing the family of acquiring $15 billion in stolen state funds. The former dictator told the news magazine Gatra in a rare interview in November 2007 that he would donate the bulk of any legal windfall to the needy, while he dismissed corruption accusations as "empty talk." Suharto's wife of 49 years, Indonesian royal Siti Hartinah, died in 1996. The couple had three sons and three daughters. Associated Press reporters Zakki Hakim and Niniek Karmini in Jakarta contributed to this article.